After posting the rules to Thirteen, Twenty-One, and Ninety-Nine, we couldn’t resist covering yet another numerically-titled game. 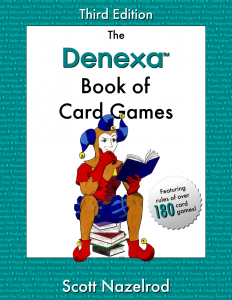 Thirty-One shares more of a resemblance to Knock Poker and Gin Rummy than any of the previously-named games, however. The object of Thirty-One is to obtain a total count of cards in one suit which is the closest to 31 without going over. Thirty-One requires a standard 52-card deck of playing cards. 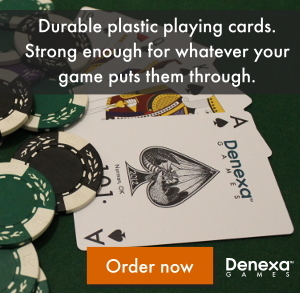 If you’ve read more than a few of these posts, you know that statement is bound to be followed by a recommendation that you use Denexa 100% Plastic Playing Cards. Well, guess what? This post doesn’t have one. Each player will also usually place a stake on the outcome of the game in the form of a single banknote of the appropriate currency. What denomination it is doesn’t matter, so long as everyone’s is equal, but often a $5 bill is used. The game can be played without wagering, however, by distributing four markers or tokens of some kind (such as poker chips) to each player. Shuffle and deal three cards to each player. The remainder of the pack is placed in the center of the table, forming the stock. The top card of the stock is flipped face-up and placed next to it and is called the upcard, the top card of the discard pile. The value of each card in Thirty-One is as follows: aces are worth eleven, face cards are worth ten, and all other cards are worth their face value. Each player is trying to obtain as closest as possible to a score of 31 in one suit. The player to the left of the dealer goes first. This player draws either the upcard or a card from the stock, then discards one card face-up to the discard pile. Play then continues with the next player to the left. If a player has obtained a score of exactly 31 in one suit, this is called a blitz, and the player immediately reveals it, ending the hand. If a player is satisfied with their score before someone reveals a blitz, they may knock on the table rather than drawing and discarding. Each player after them has one additional turn to improve their hand. When the turn of play returns to the player who knocked, the hand ends. At the end of the hand, whether by a player revealing a blitz or by knocking, all players reveal their hands, and each is scored. If a hand contains three cards of different suits, the highest card is the hand’s score; if the hand contains two or three of one suit, the values of these cards are totalled to score the hand. The player with the lowest score is the loser of the hand; this player folds one corner of their bill (or forfeits one marker) to signify the loss. If a player knocked to end the hand, and this player is the loser, the penalty is doubled. Play continues until one player has folded all four corners of their bill (or has run out of markers). This player remains in the game, but if they lose a fifth hand, then they are eliminated and surrender their stake into the center of the table. Game play continues until all players but one have been eliminated. The remaining player is the winner of the game and keeps all of the money.